A very little bird showing me his (or her) crown. Saw him during the Audubon bird count at my feeder window. I would not have guessed this bird was anything more than a goldfinch until I caught a glimpse of that fleck of red. 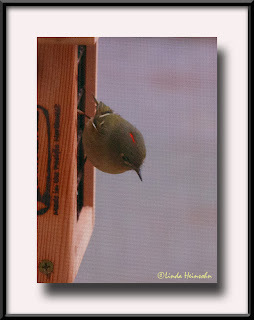 Turns out it's a Ruby Crowned Kinglet. Pretty fancy for plain old Portland. Shot through the screen on a low light day. Post involved levels and unsharp mask. Not a very good pic and won't make my list of keepers. Still, it's what's up for my daily pic.